Laos is one of the world’s most enigmatic countries. Poor and isolated from the world for much of its history, Laos is starting to open up and attract a lot of tourism. It is a deeply spiritual country and you can learn a lot about it by exploring its temples and cuisine. This itinerary is ideal if you’re looking for a shorter break in one of the less well known parts of Asia. Despite the impact of colonialism and communism, much of Laos’ traditional culture survives intact. When you arrive at Luang Prabang airport your driver will meet you and take you to your hotel. You’ll have the day to settle in and explore the ancient city at your own pace. 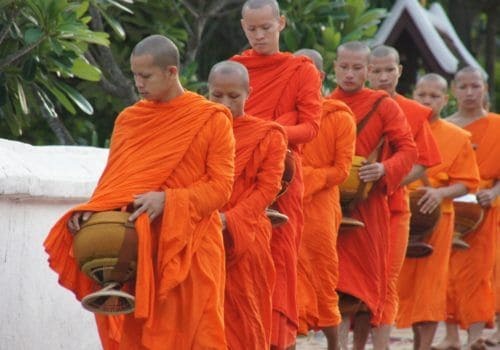 In the morning you’ll be taken on a guided tour of Luang Prabang. You’ll learn about its incredible history through its temples – including Wat Xieng Thong – and its palaces. This is a deeply spiritual city and you’ll be invited to take part in a Baci Ceremony: a goodwill ceremony performed to welcome guests or mark an important event. In the evening you’ll head to the Royal Ballet Theatre to see a show. The Royal Ballet preserves the nation’s cultural heritage through its folk dances and vignettes from Lao-Ramayana, dating back to the 16th-century. Later, you’ll enjoy a spot of fine dining at L’Elephant. This morning you’ll visit the Luang Prabang’s National Museum, the former royal palace. It’s a rich treasure trove of art and jewels that’ll give you an insight into Laos’ turbulent history. You’ll then visit the golden temples Wat Mai and Wat Sensoukarahm. The tour will finish at the holiest temple, Wat Xieng Thong. In the afternoon you’ll sail down the Mekong River on board the elegant Nava Mekong. You’ll pass villages, see the sunset and enjoy a range of Lao dishes. After breakfast you’ll head out on a guided cycling tour. You’ll explore Phosy Market, where you’ll no doubt want to purchase some gifts. Then, you’ll cycle to Ock Pop Tock, where you’ll discover the process of silk weaving. For lunch you’ll dine at Le Tangor, one of the best restaurants in Laos. This will be followed by a cookery lesson with a local chef. You’ll be able to recreate some classic Lao cuisine when you get home. Naturally, you’ll be sampling all the dishes. On your last full day you can explore the city at your own pace, revisiting some of your favourite spots and exploring the food markets. If you’d like to taste some more traditional Lao food, head to 3 Nagas for dinner. This restaurant has an excellent wine menu. When you’ve done some last minute shopping you’ll be driven to the airport for your return flight.